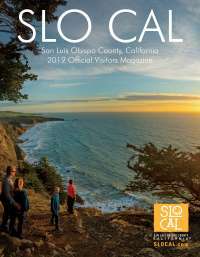 San Luis Obispo County (SLO CAL) is parked right between Los Angeles and San Francisco. With 365 days to fill in 2017, why not enjoy some of them right here with us! Bursting with outdoor adventure, wineries, cultural experiences, craft beer and distilleries, artisanal products and so much more, San Luis Obispo County is perfect for your 2017 vacation destination. If you&apos;ve never visited us before, don&apos;t worry! 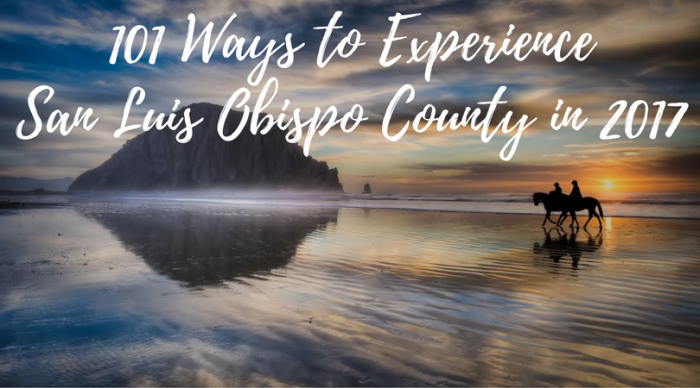 We&apos;ve compiled a list of 101 ways for you to experience San Luis Obispo County in the new year. 1. Eat abalone farmed from the Cayucos Abalone Farm. 2. Explore the caves at Dinosaur Caves in Pismo Beach by kayak. 3. Test your skills at the Vista Lago Adventure Park at Lopez Lake in Arroyo Grande. 4. Visit the Ragged Point Inn lookout and take an iconic picture through the Portal to Big Sur. 5. Try a flight of local cider at Bristols Cider House or Tin City Cider Co.
6. Hunt for Olallieberries in Cambria. 7. Visit every Restaurant on our Restaurant Month list. 8. Hang out with the Elephant Seals at Piedras Blancas Elephant Seal Rookery. 9. Brain freeze! Choose from five featured flavors at Doc Burnstein’s Ice Cream Lab in Arroyo Grande every Tuesday for an all-you-can-eat extravaganza. 10. Take a sunset cruise in Morro Bay. 11. Grape stomp during Harvest Wine Weekend in Paso Robles. 12. Camp in the orchards at Windrose Farm. 13. Hop in a dune buggy and ride around the Oceano Dunes. 14. Taste a variety of apples at See Canyon Fruit Ranch. 15. Pick a basket full of apples at SLO Creek Farm during their Fall u-pick season. 16. Follow the SLO County Whale Trail. 17. Try and count the butterflies at the Monarch Butterfly Grove. 18. Visit Harmony, population 18, and take a selfie with their selfie frame. 19. Fly a kite during the Morro Bay Kite Festival. 20. Go nuts! Dine at any of the McLintocks and grab an order of Turkey Nuts. 21. Hike up to Condor Lookout on Hi Mountain Road for 360 degree views. 22. Did you know SLO County has a waterfall? Head out to Big Falls in Arroyo Grande. 23. What’s the catch of the day? Book a charter and go deep-sea fishing in Morro Bay. 24. Taste a different local wine every day during California Wine Month in September. 25. Go horseback riding on the beach. 26. Feel the rush! Go skydiving in Pismo Beach. 27. Compete in the Tri-tip Challenge. Hike Bishop Peak, Cerro San Luis and the Cal Poly P in one day then reward yourself with a tri-tip sandwich. 28. Experience the San Luis Obispo County super bloom in the Spring. Drive out to the Carrizo Plain for wildflowers as far as the eye can see. 29. Get away from the city lights and hunt for stars during a meteor shower in Montana de Oro. 30. Disc golf amongst the vineyard at Castoro Cellars’ Whale Rock Disc Golf Course. 31. Taste all of the donut delicacies from Surfside Donuts in Pismo Beach. 32. Grab your mountain bike and traverse the trails of Montana de Oro. 33. Grab your pack of 4-legged friends and let them feel the sand between their paws in Morro Bay, Cayucos, Avila Beach, Pismo Beach or Montana de Oro. 34. Take the plunge! Run, jump or skip into the cold water of the New Year at the Polar Bear Dip in Cayucos or Polar Plunge in Avila Beach. 35. Hike out to the Serenity Swing and take a picture to make your followers jealous. 36. Catch a concert at the Historic Fremont Theatre. 37. Harken back to the days of yester year and catch a double feature at the Sunset Drive-in. 38. Eat as much clam chowder as you can at Splash Café. 39. Learn how to surf in Pismo Beach. 40. Experience the life of a Central Coast rancher at Lazy Arrow Outdoor Adventures. 41. Visit the grandeur and majesty that is Hearst Castle. 42. Find as many moonstones as you can on Moonstone Beach. 43. Marvel at the amount of lights it takes to make the Cambria Christmas Market come alive. 44. Attend as many concerts as you can at Vina Robles Amphitheatre. 45. Go on an excursion tour at Halter Ranch. 46. Grab a guide and hunt for wild boar in the back country of SLO County. 47. Take a selfie with one of the zebras that roam the Hearst Castle property. 48. Spend a summer night listening to a local band outdoors at Barrelhouse Brewing Co.
49. Take a brewery tour at Firestone Walker’s hometown digs in Paso Robles. 50. Sign-up for a docent-led tour of the Pismo Preserve. 51. Get the ultimate California experience and arrive to SLO County on theAmtrak Pacific Surfliner. 52. Attend a different summer community concert every day of the week. 53. Cycle the same route the Amgen Tour of California riders have completed. 54. Take flight! Enjoy a ride in a bi-plane over scenic Pismo Beach. 55. Challenge your balance to standup paddleboarding and yoga. 56. Expand your bird knowledge and go birding in the Morro Bay Estuary during the Winter Bird Festival. 57. Shop like a local at one of the 12 weekly Farmer’s Markets. 58. Thrill your sense of smell during a visit to Harmony Lavender during the lavender bloom from June-September. 59. Mosey the art galleries, museums and shops of downtown San Luis Obispo during Art After Dark every first Friday. 60. Pick your bounty of fresh strawberries in Arroyo Grande then attend the Arroyo Grande Strawberry Festival. 61. Spend a weekend in wine country during the Paso Robles Wine Festival. 62. Visit the Morro Bay Skateboard Museum and fine the world’s second largest skateboard. 63. Experience harvest in SLO Wine Country during Harvest on the Coast. 64. We bet you didn’t know spirits could be made from grape juice. Follow the distillery trail and taste local gin, brandy, vodka and more. 65. Go on a kayaking excursion with Central Coast Kayaks. 66. Take a walk to the middle of Oso Flaco Lake in Nipomo. Don’t worry, there’s a boardwalk. 67. Show your inner movie buff and attend as many showings as you can at the SLO International Film Fest. 68. Taste the other fruit of SLO County’s labor and go olive oil tasting. 69. Visit Mission San Miguel Arcangel. 70. Head out to Cholame on Highway 46 and visit the James Dean Memorial. 71. Go on a road trip along Highway 1, the most iconic route in California. 72. There are nine sisters but only seven of them are hikeable, do them all in one weekend! 73. Hit the open road and cycle your way across SLO County. For a fun challenge, follow the same route as the Amgen Tour of California from Pismo Beach to Morro Bay. 74. Visit Charles Paddock Zoo in Atascadero, the only zoo in SLO County. 75. Take a tour of the Historic Atascadero City Hall and find out why they call it Tent City. 76. Make your mark! Stick a piece of gum on Bubblegum Alley in San Luis Obispo. 77. Visit the other castle on the hill in Cambria, Nitt Witt Ridge. 78. Take a dip in the naturally heated mineral spring water at the Sycamore Mineral Springs. 79. Pony up - on a horse that is. Gallop along the beach in Pismo Beach, Morro Bay or Montana de Oro. 80. Visit the Mission San Luis Obispo de Tolosa. 81. Take a bike ride down the Bob Jones Trail all the way from San Luis Obispo to Avila Beach. 82. Kayak or paddleboard out to the Point San Luis Lighthouse. 83. Indulge yourself and try every flavor of the world-famous cake at the Madonna Inn. 84. Swing with a view at the top of the Avila Ridge Trail. 85. After seeing the elephant seals, take a tour of the Piedras Blancas Light Station in San Simeon. 86. Get your fill of fried food, carnival games and concerts at the California Mid-State Fair. 87. Wake up early and catch a sunrise above the clouds at the top of Valencia Peak. 88. Pack a picnic and spend the day at William R. Hearst State Beach looking for dolphins or a pod of whales. 89. Visit every pier in San Luis Obispo County (hint, there’s 5 of them). 90. Taste the roasted goodness at one of the locally owned coffee shops. 91. Immerse yourself in a play, symphony performance or theatre performance at the Performing Arts Center. 92. Shop the Village of Arroyo Grande and take a walk across the swinging bridge. 93. Take your dog on a date! Visit the pet-friendly wineries, restaurants, hotels and activities of SLO County. 94. Grab the kids and visit the Paso Robles Children’s Museum for a day of fun and wonderment. 95. Golf your way across SLO County! Swing your club at Hunter Ranch, Dairy Creek, Chalk Mountain, Avila Beach Golf Resort and Morro Bay Golf Course. 96. Try a different local beer every day during SLO Craft Beer Week. 97. Become a Stewardship Traveler along the Highway 1 Discovery Route. 98. Grab a cup of coffee and take a morning stroll in the Elfin Forest in Los Osos. 99. Cheer on the riders as the Amgen Tour of California races throughout SLO County. 100. Take a selfie with all of the scarecrows during the Cambria Scarecrow Festival. 101. Spot all 101 cows located throughout San Luis Obispo County during Cowparade SLO County.